Stuart Baily has drawn up the shape of his Current Keel Dimensioned drawings. not tested in the real world, cannot be guaranteed. Dimensioned drawings. Stuart Baily has had a solid keel handle made up for his Bradwell. 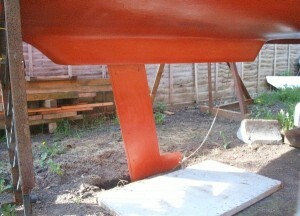 This was constructed by by DC Marine Ltd, of Ashwellthorpe (01508 489406) for £60 (2005).